● How to look up a PUC Docket Number. Go here. Select Retrieve Filings. Select Login. ● LCRA submits it's application to amend its CCN for the McCamey D to Kendall to Gillespie 345-kV CREZ Transmission Line in Schleicher, Sutton, Menard, Kimble, Mason, Gillespie, Kerr, and Kendall Counties, Texas to the PUC. The LCRA application is available at the PUC website on docket # 38354. LCRA TSC has combined two CREZ priority projects, McCamey D to Kendall and Kendall to Gillespie, for the purpose of filing one application with the PUC to amend its CCN. The application will be for the McCamey D to Kendall to Gillespie 345-kV CREZ transmission line. LCRA TSC proposes to construct two new, 345-kilovolt (kV) transmission lines, primarily on double-circuit capable lattice structures. The first transmission line will be a double-circuit line that will connect the designated McCamey D Station, to be located in northern Schleicher County ,to the existing Kendall Station located in western Kendall County. LCRA TSC will install both circuits on this transmission line. The first transmission line may be located in portions of Schleicher, Sutton, Menard, Kimble, Mason, Gillespie, Kerr, and Kendall counties. The second transmission line will connect the existing Kendall Station, located in western Kendall County, to the existing Gillespie Station, located in central Gillespie County. LCRA TSC initially will install one circuit on double -circuit capable lattice structures, which will accommodate a second circuit when necessary. The second transmission line may be located in portions of Kerr, Kendall, and Gillespie counties. LCRA TSC presented information about the Twin Buttes to McCamey D to Westwind to Kendall CREZ project and the Westwind/Kendall to Gillespie to Newton CREZ project at open houses held in May 2009. LCRA TSC eliminated the proposed Westwind Station from further consideration as a routing point because the Electric Reliability Council of Texas (ERCOT) recommended against it. 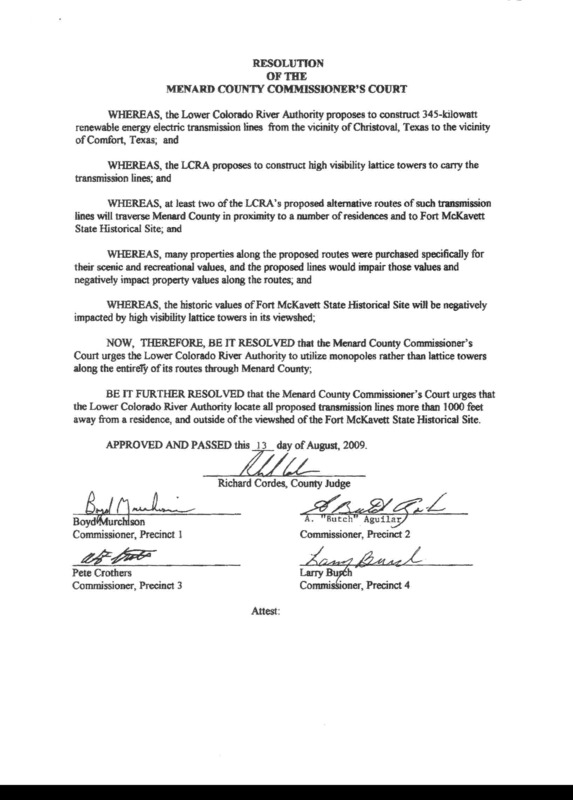 In September 2009, LCRA TSC separated the two CREZ projects into three for the purpose of filing separate CCN amendment applications for the three projects with the PUC. LCRA TSC is filing its CCN applications for the Gillespie to Newton 345-kV CREZ transmission line project on October 28, 2009 and the Twin Buttes to McCamey D 345-kV CREZ transmission line project will be filed on January 15, 2010. ● Aerial Photography Interactive Map at LCRA (use this one to find out if your property is on a line segment) Watch the Interactive Map Tutorial for tips on how to use the map.